December brings holiday cheer and a warm glow to Vancouver Island homes, but Vista Radio morning man Uncle Scotty has spent the first 11 days of the month working, eating and sleeping inside an ice-cold semi-trailer. The 53 ft VanCam freight truck was parked outside Save-On-Foods collecting donations for the Campbell River Food Bank. Scotty wasn’t allowed to leave until there was no space left for him to stay. 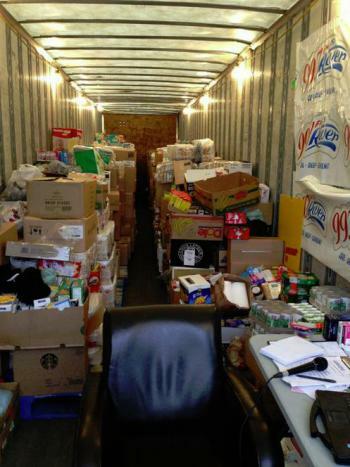 The 4th Annual River Relief Truck saw the power of radio bring out the best in Campbell River,delivering food to those in the community who otherwise might not be able afford a hot meal for themselves. Over 30 palettes of food and over $16,000 cash will help the Campbell River Food Bank well into 2013. The 600 frozen birds collected on Turkey Tuesday will be shared between the Salvation Army’s hot meal program, the Knights of Columbus and the Campbell River Food Bank.